The 2006 Annual Meeting was held, as it is done traditionally before the first board meeting of the calendar year. There were seven board positions up for election, and seven candidates running for the Board of Governors; therefore there were no elections. In 2005, our synagogue welcomed 23 new members in 2005. A Malaveh Malka party (which means the escorting of the Shabbos Queen at the end of Shabbos) took place at Congregation Kneseth Israel. The lively party was well attended by people of all age groups. After havdalah, refreshments were served, and a game of "Jewish Bingo" with prizes was led by Bracha Weisblum. The talented Moshe Samueleis led a spirited round of Jewish songs and dancing to conclude the evening. It was a lot of fun!! Congregation Kneseth Israel welcomed a very special guest at Rabbi Weisblum's "Israel: Past and Present" lecture series. Mr. Sol Milgrom, a 102-year old veteran of the Israeli Independence War, shared his experiences when he immigrated to Palestine from Poland in 1921, and the struggles and triumphs of the Jewish state throughout the years. On February 18, he will celebrate his 103rd birthday at the historic B'nai Israel Synagogue in downtown Baltimore. His secret to long life is to strive to have a "good soul", not be envious of your fellow, and to always turn a negative into a positive. The Kneseth Israel Hebrew School hosted a Tu B'Shevat Seder on Sunday, February 19 at 10:00AM. This program featured a morning of songs, discussion using a Tu B'Shevt seder book, and a play performed by the children of the school. On Tu B'Shevat we celebrate a New Year for the Trees, rejoicing in the fruits from the trees and of the vine, which also marks the beginning of spring in Israel. The event was originally scheduled for the previous Sunday, but was postponed due to snow. "We Call This Place Home: Jewish Life in Maryland's Small Towns"
The local community celebrated a wonderful exhibit in the Miller Senate Office building titled, “We call This Place Home: Jewish Life in Maryland’s Small Towns.” On Tuesday, March 7, 2006, the United Jewish Council together with the Jewish Museum of Maryland, hosted this wonderful exhibit showing some of the history and experience of Jewish life in Maryland’s small towns. Our own Congregation Kneseth Israel was one of the featured synagogues, being the longest serving synagogue in Anne Arundel County. The Kneseth Israel Hebrew School hosted their first Purim Carnival on Sunday, March 12, 2006. The carnival included children and their families from the Kneseth Israel Hebrew School, Congregation Kol Ami Hebrew School, and the Aleph Bet Jewish Day School. Special thanks to Larry Snyder for lending the equipment to the school, and to his son Philip Snyder and his friends for helping with the games. Over 140 people attended the Purim service. A good time was had by all -- which is what Purim is all about! Kneseth Israel Hebrew had a unique experience at school, making their own matzah from scratch, baking it, and eating it. The school is grateful to Rabbi Nachum Light and his wife Hindy Light and son Mendel from the Chabad of Anne Arundel County for providing the materials, the oven, their time and expertise in teaching the children about the preparation of matzah which is eaten during the festival of Passover. Congregation Kneseth Israel hosted it's second of two Shabbaton weekend celebrations for our 100th anniversary. On Saturday, the Shabbos Services recognized individuals who had celebrated simchas over the years at Congregation Kneseth Israel. Almost all who participated in the service celebrated a Bar or Bat Mitzvah or were married at Congregation Kneseth Israel. The sermon was given by Dr. Jason Rosenblatt, a Milton Scholar and professor at Georgetown University and son of the late Rabbi Morris D. Rosenblatt and Rebbitzen Emirita Esther Rosenblatt. On Sunday, a very festive and delicious breakfast was served, with the guest speaker being Gary Rosenblatt (Jason's brother), Publisher and Editor of the Jewish Week in New York. Kudos to the Shabbaton Committee of Stephen Sutton (Chairman), Mark Goldberg, Leslie Gradet, and Holly Lindeman. The 100th Anniversary Committee is chaired by Annapolis natives Anna E. Greenberg and Dr. Laurence E. Block. The 17th annual Aleph Jewish Day School Bet Dinner and Auction fundraiser was held at Congregation Kneseth Israel. Being honored were Bob and Renee Epstein, generous supporters of the school. Bob serves on the executive board for the school. Bob also serves on the board for the Kneseth Israel Hebrew School and has been the Aliyah Chairman during the High Holidays for the past three years. Renee has done an outstanding job as the Membership Chairwoman for our synagogue, and serves on the Board of Governors for Congregation Kneseth Israel. A classy evening to honor a very classy couple. The Kneseth Israel's new formed Men's Club held their first event, a complimentary breakfast with guest speaker Joe Gross, Sr. Sports Writer forThe Capital (Annapolis' daily newspaper). Mr. Gross has been with the newspaper since 1973 and is a familiar name and face to almost all Annapolitans. He shared a lot of great stories and took many questions. About 25 men attended. Congregation Kneseth Israel hosted a Lag B'Omer picnic at the synagogue, which was attended by about 60 people, including many of the families of the Hebre School children. Grilled hamburgers, hot dogs, salads, beverages, and desserts were served. Perhaps the greatest event ever in the history of Congregation Kneseth Israel was the 100th Anniversary Gala Banquet. A cocktail reception took place under a tent, a tree was planted and dedicated to the past presidents, a dinner was served, a slide show and music and narration was presented that summarized our close knit Jewish community over the past 100 years, and a beautiful new window was unveiled, donated by Rita and Arnold Cohen. A classy affair for a great synagogue! The Kneseth Israel Sisterhood hosted a paid-up luncheon, where they discussed business, enjoyed a delicious brunch, and welcomed guest speaker author Mark Carp ("Abraham: The Last Jew"). A Very Successful first year! Alyssa Janowitz, daughter of Dr. Michael and Abby Janowitz, became a Bat Mitzvah at Congregation Kneseth Israel on June 26, 2006. Alyssa attends Central Middle School where she is on the Principal's Honor Roll, participates in orchestra, and plays field hockey and lacrosse. She attends the Kneseth Israel Hebrew School. Below left is Rabbi Weisblum and Alyssa. At the right, is her Bat Mitzvah project which was participating in a Kid's Triathalon to raise proceeeds for the Make-A-Wish Foundation. She raised over $800 in her project. See Rabbi Weisblum's tribute that he gave Alyssa at her Bat Mitzvah here, and her Bat Mitzvah speech can be found here. The Rabbi Morris D. Rosenblatt Memorial Lecture featured guest speaker Dr. Deborah Lipstadt, Dorot Professor of Modern Jewish and Holocaust Studies and director of the Institute for Jewish Studies at Emory University in Atlanta. She is the author of "Beyond Belief : The American Press And The Coming Of The Holocaust, 1933- 1945","Denying the Holocaust: The Growing Assault on Truth and Memory" and "My Day in Court with David Irving: History on Trial". She gained international attention in her successful defense in England against Holocaust denier, David Irving, who sued her for libel for calling him a denier. Irving suffered a resounding loss. At the lecture (attended by over 150 people), she shared her experiences of the trial, and the reaction from the world community. More information about her trial can be found at http://www.hdot.org/ieindex.html. The program was chaired by Holly Lindeman. For the third year in a row, an outing to an Orioles game raised money for the synagogue (for the second year, the Hebrew school). A total of 54 tickets were sold, and many were purchased and distributed to the Jewish Big Brother and Big Sister League, the Big Brothers Big Sisters of Central Maryland, and the Boys and Girls Club of Annapolis. Unfortunately, for the third straight year the Orioles lost, on this day 9-2 to the Toronto Blue Jays. Over $12,000 was raised by donors and participants of an Israeli Support Festival at Kneseth Israel. Proceeds raised went to the Israel Emergency Fund for the United Jewish Appeal of Anne Arundel County. Ethan Halpern led dancers of all ages during the afternoon, and grilled hot dogs, hamburgers, and falafels made from scratch were sold at the event. All proceeds will go be sent directly to Israeli families and institutions that have suffered damage and devastation during the recent war with Hezbollah, which was a major blow to the Israeli economy. Yom Kippur and "Break the Fast"
Congregation Kneseth Israel featured another memorable High Holiday services for Rosh Hashanah and Yom Kippur in 2006/5767. A total of 407 seats were sold for the holidays, and the choir was the largest ever, featuring 10 members. The festival of Succot at Kneseth Israel featured a cookout, attended by about 50 people. Delicious hamburgers and hot dogs were cooked on the grill, along with potato salad, cole slaw, beverages, and dessert. Everyone had a great time, especially the children! Photos below are of Rabbi Weisblum decorating the succah with the Kneseth Israel Hebrew School, and teaching the Kneseth Israel Nursery School students about Simchat Torah. The succah photos were taken by Michelle Burgess, the Simchat Torah photos were taken by Leslie Gluckman. 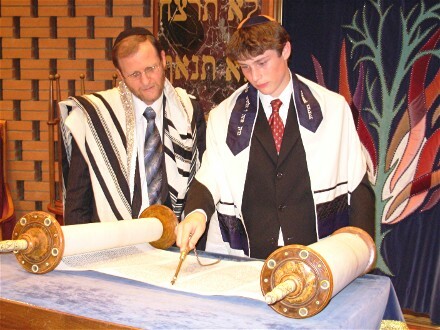 Asher A. Stusek, son of Sam and Amy Stusek became a Bar Mitzvah on Saturday, October 28 (Parsha Noach). Asher is an 8th grade honor roll student at Severn River Middle School and attends the Kneseth Israel Hebrew School, and is fourth generation member of our synagogue. Kneseth Israel Hebrew School hosted a fun-filled Havdalah pizza party on Saturday, November 11. After the ceremony and dancing in the sanctuary, everyone moved into the Reiter Auditorium for delicious Tov Pizza and games. The Kneseth Israel Sisterhood and the Annapolis Chapter of the National Council of Jewish Women teamed up to host their annual fashion show and purse party. Merchants were present to sell clothing, jewelry and handbags. Chanukah items were also sold. Sixteen hungry men and one lady attended the Men's Club Steak Dinner. For those who did not want steak, grilled chicken or grilled salmon were on the menu. A good time was had be all! Natalie Tham, daughter of Drs. William and Susan (Zimmerman) Tham, became a Bat Mitzvah on Saturday, November 18. Natalie chanted the Haftorah for Chayei Sarah. Natalie is a 7th grader at the Beth Tfliloh School in Baltimore and graduated from the Aleph Bet Jewish Day School. She is a great student, is very well liked, and attends services regularly at Kneseth Israel. The Kneseth Israel Hebrew School and other children from the synagogue took an exciting bus trip to Baltmore, and visited the Maryland Jewish Museum, the Lloyd Street Synagogue (nation's third oldest synagogue, Tov pizza, and some other Jewish institutions in Baltimore. The children and their parents learned a lot and had a wonderful time! An exciting Havdalah service, spaghetti dinner, and concert drew about 130 people to Kneseth Israel. Performers were well-known Israeli musicians, singers, and story tellers Tirtza Singer and Chana Sophia Yaffe. The lively performance was thoroughly enjoyed by everyone, and even got people out of their seats to dance. The performers played the harp, keyboard, guitar, and sang beautifully. A Sunday Brunch at Kneseth Israel took place with guest speaker Jeff Rubin Associate Vice President of Communications from Hillel, whose topic was "Things that Matter". There was plenty of delicious gourmet breakfast food served, and the Sisterhood gift shop was also selling their goods for the Chanukah season. The Anne Arundel community received a huge treat on the evening of December 12, 2006 when Lenny Solomon and his group, “Shlock Rock” gave a concert sponsored by the UJC of AAC held at Congregation Kneseth Israel. The group with its message of “Be good, be cool, be Jewish,” enthralled an audience of all ages as it spread “Jewish pride, identity, and awareness,” by the members singing their own wonderful lyrics to the melodies of old and new classics. Fun was definitely had by all! Kneseth Israel hosted a lively Chanukah celebration on Sunday, December 17 which was attended by over 75 people. The afternoon included a mixed choir, a delicious luncheon, Menorah candle lighting, skits put on by the Hebrew School children, and door prizes.